A line on a TV ad goes as follows “there is nothing small about your small business.” That is just so true. Being a small business owner I just can’t speak enough about the challenges of trying to juggle all aspects of keeping your brand up and running by one person. From marketing and sales, to accounting and taxes, to production and quality control, to staff training, hiring, firing and everything else in between. One of the pillars we stand on as a brand is #DontEatAlone. A cause we work everyday for, feeding people who are in need in our communities. As much as we’re in love with our cause “hunger fight,” there is no denying that it is a whole full-fledged operation on its own. This is where one of our most valued partners becomes indispensable: Give One for Good Food® Network. They work closely with us to connect our contributions to a network of nonprofits who make the greatest impact in the community. They do the research, the legwork, the communication and the follow-up so every business is able to conveniently give back. 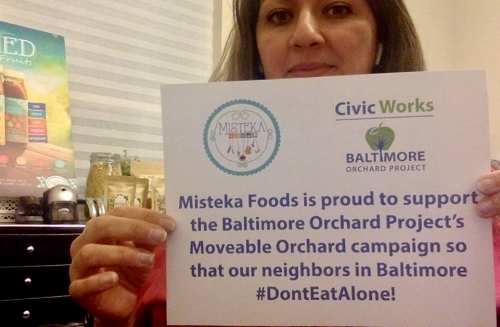 Through them we were able to make contributions to The Baltimore Orchard Project @baltorchrd AND The Crossroads Community Food Network @crossroadsntwk and for that we are so thankful! Give One for Good Food® Network again are indispensable to us. They help us reach further in our mission and maximize the impact of our donations. We are proud to carry their seal on our products and marketing collateral and have them as a preferred #payitforward partner. Special thanks to Danielle DeLisle, their very supportive Program Coordinator. Newer PostDon't Take Our Word for It....Trust Our Business Members! Older PostMOM's Organic Market Joins the Give One for Good Food® Efforts!